All are working but not really at work or looking for one. Labor force participation is declining despite record low unemployment rates (1997-2017). (Click on the image to enlarge) Over this labor day, it’s good time to review the status of US employment. One of the biggest economic news headline in recent years has been the record low unemployment rate (another one is record low interest rate). At 4.4% (in Aug 2017) this simply says 95.6% of employable people are actually working. 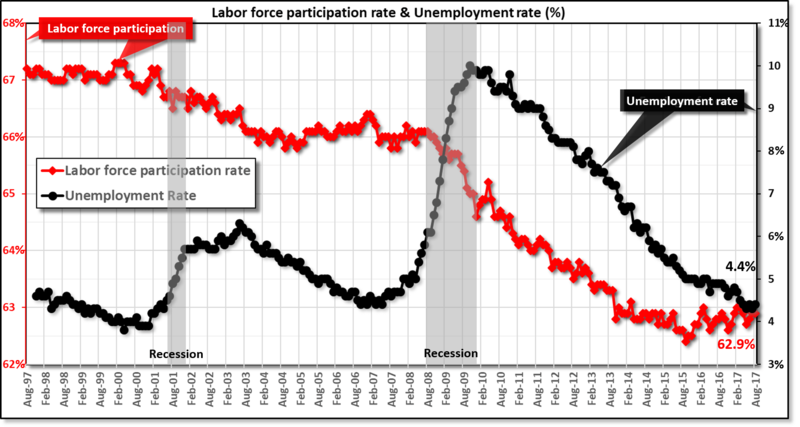 Another key data, the current labor participation rate is also record low at 62.9%. It is the number of employed workers and those actively looking for a job, and has declined by almost 4% in last 20 years. If so many people are being employed, why fewer of them are participating? One common argument given by economists is the retirement of baby boomer and there is a certain truth to this argument. The labor participation trend (red curve) shows a steady decline, suggesting the baby boomers have indeed started calling it off. As the recession hit in 2008, this rate has a much faster decline suggesting more people started to leave or firms forced older workers to leave. Since these experienced workers cost the employers more, there would have been a much bigger return to either completely eliminate them or replace them with younger workers at lower wages. However, one would expect this declining trend to revert & many of these workers to return back to the labor force. That is not happening. The labor participation rate has steadily declined until the end of 2016, stabilizing now to a record minimum. With such a low unemployment rate, one would expect more people to return to the workforce. There could be a few explanations to why this is not happening: skill erosion of these long time unemployed workers has made them unsuitable to work again. That’s bad news and supports President Trump’s argument that these BLS numbers are not reflective of the reality on main street. It’s also possible that the booming stock market has emboldened the retirees to live-off their impressive gains from retirement funds invested in the stock market boom. However, these funds saw an almost 40% dip during recession, so that gain is not as high as it appears. Most likely, the real truth is somewhere in between – in how the calculations are done for unemployment rates as this New York Times story explains. However, one thing is very clear: don’t trust blindly what the bean counters report. Numbers don’t lie, but they can certainly made to lie, depending on how they are collected and interpreted. Source: Bureau of Labor Statistics (unemployment rate & labor participation rate data).